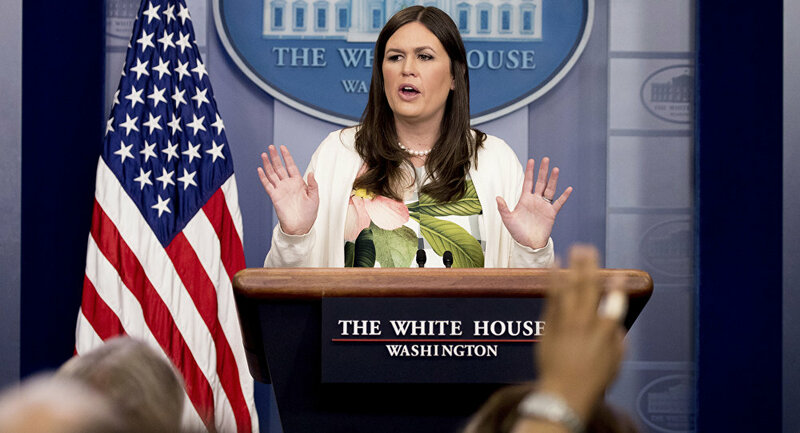 Big Bang Theory showrunner Chuck Lorre, who has previously been vocal about his critical stance towards Donald Trump and his administration, has mocked White House Press Secretary Sarah Sanders for her remark about God’s will bringing Donald Trump into the Oval Office. “God told me He hasn’t spoken to Sarah Sanders since she was fourteen years old and praying for her skin to clear up. I have no reason to doubt Him”, the recent message on the so-called vanity card, which appears after each episode, read. — John Sanders (@JohnSandersSr) 8 февраля 2019 г. ​The remark prompted online outrage. Some branded the TV maker misogynistic for making derogatory comments about Sanders’ appearance. — Suze Michelini (@emilia_suze) 9 февраля 2019 г. — Charles Gay (@leotisone) 9 февраля 2019 г. ​Others pointed out that he is giving children a bad example by teaching them to bully. — Christy Boone (@chrissyboone) 9 февраля 2019 г. — Joe Grober (@mrgrober) 9 февраля 2019 г. — Nicole (@nicantoin) 8 февраля 2019 г. ​Some shamed him for double standards and spoiling the hit show with such political attacks. — Gov. Mike Huckabee (@GovMikeHuckabee) 8 февраля 2019 г. — Brad L Hodges (@blhodges) 8 февраля 2019 г. — Mike (@mike_clowser) 8 февраля 2019 г. ​Others defended Lorre, saying that he had acted within the bounds of freedom of speech. Actually, none of us finding Chuck Lorre and his words to be disgusting. Unlike Sarah Sanders on duty, Chuck Lorre is protected by the 1st Amendment, and you should respect that like we respect your right granted by the 2nd Amendment. — Vlad Markov (@vmarkov) 9 февраля 2019 г. ​Chuck Lorre Productions has provided episodes of their hit TV series Mom, Two and a Half Men, Dharma and Greg, Mike and Molly and Big Bang Theory with hundreds of such off-the-top on-screen messages. They contain not only political references, but also graphical jokes, goofy photos and shout-outs on various topics, from family to the creative process. This is not the first time that Lorre has made Donald Trump the target of his sarcastic remarks on vanity cards. In May 2017, he roasted Trump by taking aim at his darling TV project The Apprentice, which the incumbent president used to host, as he boasted that his project beat Trump’s show in the ratings. “Defeat terrorism and crazy dictators? He couldn’t even defeat ‘Two and a Half Men'”, the vanity card with the rating chart said.